Haryana Board Class 12 Date Sheet has been released by the Haryana Education Board. The candidates who are enrolled to appear in the exam are suggested to carefully read the instructions released by the Haryana Board to avoid any confusion or misunderstanding regarding the Board exam. The examination will commence from 7 March 2018 to 3 April 2018. It is advisable to all the candidates who will be appearing in the board examination this year to read all the instructions carefully to avoid any mistake or misunderstanding. In the year of 2017, close to 2.5 lakh students appeared in the senior secondary examination (Class 12). The number of girls and boys participated were 92,655 and 1,19,626 respectively. 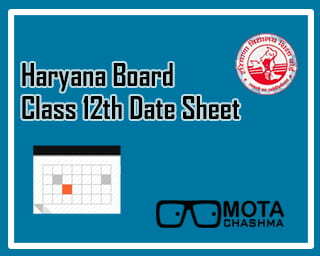 Haryana Board Class 12 Date Sheet is given towards the end of this page. Haryana Board of School Education (HBSE) is the authority which conducts the Public Examinations at Middle, Matric (Secondary or High School) and Senior Secondary School (Academic & Vocational) in the state of Haryana through the associated schools. The main purpose of Haryana Board is to spread the knowledge through a well-designed education pattern to the masses and improving the literacy rate in the state. English Special will be conducted for foreign students in Lieu of Hindi core. Candidate will bring their own Log, Trigonometry Tables & stencils for Map, and can use the colour pencil in science subjects only. Carry the admit card along with to get the entry into the examination hall. Arriving late in the examination hall will not be permitted to appear in the examination. In case of any query regarding Haryana Board Class 12 Date Sheet, you can write to us in the comment section below.